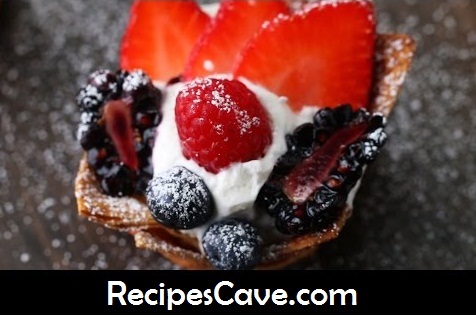 Tortilla Dessert Cups Recipe - Here is the step by step instruction to make Tortilla Dessert Cup at your home. Tortilla Dessert Cups Recipe to serve 6 peoples. 1. Preheat oven to 375˚F/190˚C. 2. Butter each side of the tortillas, sprinkle with cinnamon sugar, and cut into even quarters, making 12 pieces. 3. Place two pieces in each cup of a muffin tin and push down so that it creates a cup shape. 4. Bake for 13-15 minutes or until crisp. 5. In a bowl, mix together heavy cream, vanilla extract, and sugar. 6. Assemble the cups by placing a spoonful of whipped cream in the toasted cup. 7. Top with fresh fruits of your choice. your Tortilla Dessert Cups Recipe is ready to taste.